Showing results for tags 'soul'. Soul ring legendaries from relinquished tokens? 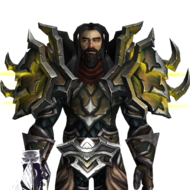 On retail, the legendary soul class rings, like the https://www.wowhead.com/item=151641/soul-of-the-huntmaster were released after the https://www.wowhead.com/item=147799/relinquished-ring. These tokens were used to snipe the specific legendaries, so when the new legendary soul rings came out, people naturally wondered whether they could also use the same techinque do get the new rings. Blizzard personel officialy answsered negativelly, meaning the ring tokens couldn't drop the Soul rings. It makes sense to ask the same question on Firestorm and I have been asking it. So far I have mostly gotten "I don't know, I can't answer that question" and also some "yes, it can be dropped on Firestorm". The confirmations however weren't really affirming and could've easily been a consequence of misinformation or a misunderstanding. Is there anyone able to reliably answer that question, either from the development knowledge or any player who got dropped that ring from the token?